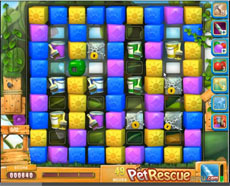 You have what you need to complete pet rescue level 498. Paint brush boosters and the rocket booster are you best allies in your task. Use the paint brush boosters to release the pets from their pet boxes and “drive” the to the bottom. Simultaneously you activate the rocket. Use it in columns there are more than one pets. As sooner as you use a key to unlock the locked blocks the easier will be to pass the level. The following walkthrough video will give you a few ideas on how to beat this level!